Today’s episode is episode 63 with my friend, Karlye Sills. Karlye and I recently met in person and she is super sweet! I loved chatting with her today and know you will enjoy hearing her story! 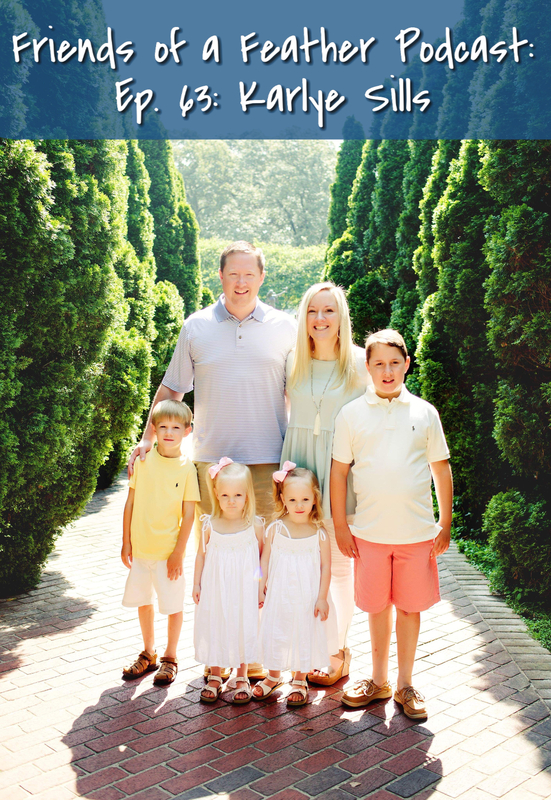 Karlye shares how she went from a wife desiring children to a mother of four children! During the years of infertility, miscarriage, a physical diagnosis of PCOS, dimished egg reserve, and diminished ovarian quality, Karlye explains how God showed her how to rely on Him and to follow His plan for her life. Through all of it, Karlye’s faith was strengthened knowing God’s plan was at work and she has experienced such peace through that! We talk about getting pregnant naturally, her two IVF cycles, and having the shock of getting pregnant with twins! We also chat about the accidental way she started her business of sharing about essential oils with the Young Living brand. She even shares her favorite 6 oils! You will be encouraged through Karyle’s story! I would love to encourage you to share the podcast with your friends! There are many episodes of different stories of women who are sure to encourage you in your faith journey! After I listen, I’m always encouraged and I desire to love Jesus more from hearing from my friends! A few I would love to suggest would be Ep. 51 with my friend Tracey when she talks about walking through her husbands gambling addiction, forgiving him, and how God restored her marriage, Also, Ep. 52 was with Mary Flo Ridley when she talked about talking to your kids about the birds and the bees that you don’t want to miss! I would love to connect with you on Instagram! This is episode 62 and my guests are Katie Norrid and Amy Mobley. 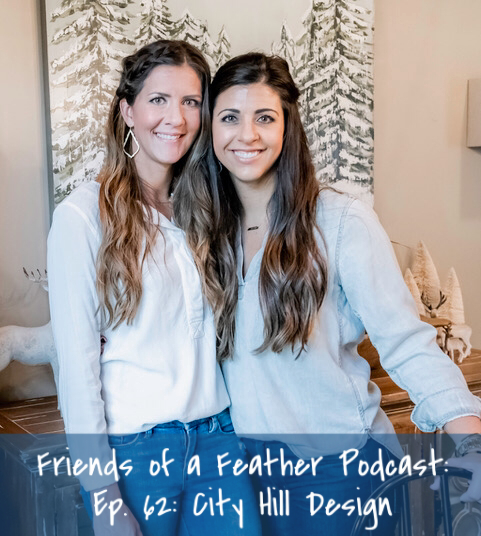 In 2017, Katie & Amy decided to take a leap and start City Hill Design and turn their talent and passion into something more by working with builders, remodelers, and homeowners in the Memphis area. With a combined 8 years of experience, they have a fantastic eye for design, a love of working hard, and a desire to help people achieve a home they can enjoyand be proud of. Amy finds joy in bringing a laid back touch into spaces with a little bit of modern aestheticwhile Katie loves crafting spaces with an old world charm while keeping things calm, neutral, and timeless. We talk about growing up together with a famous basketball brother, the memories they love about growing up, how they ended up working at the same homebuilding company and something unplanned in March of 2017 that changed everything in the best way. This feels like a conversation between friends, even if we just met the day of recording in my kitchen. I could not stop smiling while I was editing this episode. You will be encouraged in your faith walk and will be refreshed through Katie and Amy’s story! You can find Katie and Amy on Instagram at CITY HILL DESIGN or on their web site. They have a beautiful feed and I love how they interact with their followers. The sponsor for todays episode is Crew and Co products provide a practical approach to scripture memory and family devotions through unique and beautiful cards. Each card was designed by Courtney with hand lettering and original art with the purpose of being a tool to teach your kids and family about Jesus. The Scripture card sets are sure to be visually appealing for every member of the family. This season be sure to pick up the newly restocked Advent cards! The advent cards correspond with the Jesus StoryBook Bible and are a fun way for kids to learn the beauty of the Christmas story. Be sure to follow Crew + Co on Instagram and check out their products at crewandco.com! I would love to connect with you over on the Friends of a Feather Instagram ! Colby is an amazing worship leader, wife to John, mommy to Lola, and just recently had a double lung transplant after her lungs continued to decline due to having Cystic Fibrosis. So many God moments in our conversation. I loved hearing about how Colby was called only 9 days after being put on the transplant list that they had lungs for her! How Colby's community was lifting her up in prayer during her surgery, many who did not even know her! Such a raw part of the conversation when we talk about the thought of Colby not being around to raise her daughter, Lola. But, hearing the faith of Colby and what a good father God is and how she KNEW He would take care of her. Find Colby's album on iTunes. I would love to connect with you over on my Instagram page @friendsofafeatherpodcast! 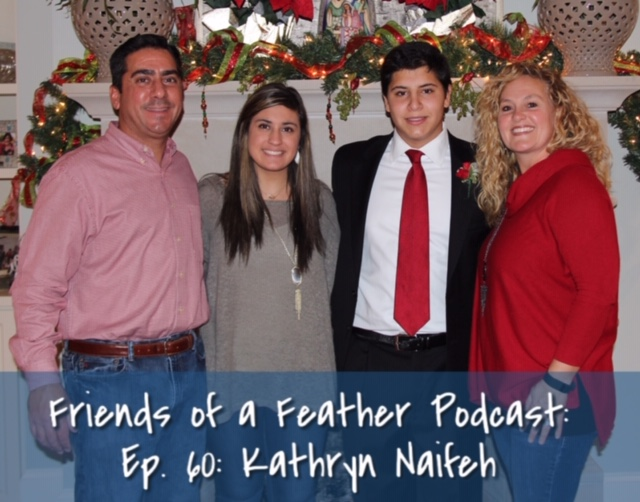 Welcome to the Friends of a Feather podcast where my friends share their story of how they have been changed by Jesus. Receive encouragement from my friend Kathryn on episode 60 today! Kathryn is a wife, mom to two high schoolers, Bible teacher, encourager, and friend to those she meets. A few years ago, Kathryn was called out of her comfort zone in order to fully use the gift of teaching that God had placed within her. Her life has been changed because of learning and teaching God's word chronologically. We talk about how Kathryn used to plan her life (or so she thought), down to when she would have her children biologically. Three IVF procedures later and God called her to drop what she thought as "perfect" and came to know him personally. Kathryn and her husband Jay were called to adopt their daughter and then their son 11 months later. Throughout Kathryn's life, you will hear how God has moved and you will be encouraged to hear the wisdom she shares, how she points us all back to Jesus, and how she knows that prayer matters. You will come away refreshed and desiring to know Him better. Once upon a time, there were three tired moms of toddlers sitting around and dreaming up the perfect weekend: time to chat with friends over coffee and delicious food, space for rest, and solid Bible teaching. Those friends decided to make that dream a reality. Story & Soul Weekend is a Memphis-area weekend retreat for and by women, designed to prioritize Scripture, Stillness, and Sisterhood. This year's retreat is scheduled for December 7-9, and we'd love for you to join us! 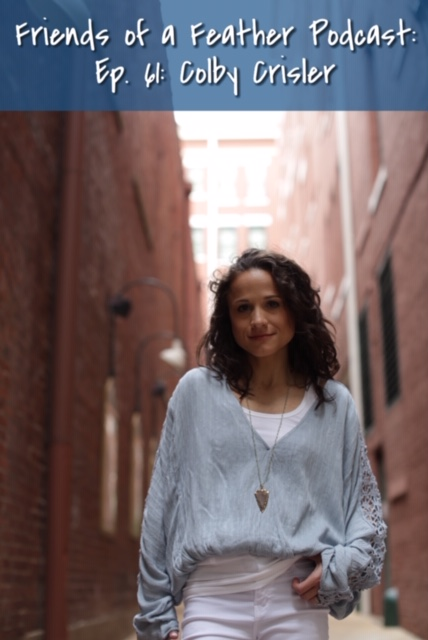 Individuals, small groups, mothers and daughters, and friends who attend Story & Soul will come away refreshed by the solid scriptural focus, the slow, restful itinerary, and the space to connect with God and one another. We also love to partner with ministries by helping provide their women with a meaningful, quality, vision-rich retreat without overextending their leaders. Want to know more? Visit us online at storyandsoulweekend.com or on Instagram @storyandsoulweekend. I would LOVE to connect with you over on Instagram and on Facebook! Artwork by the talented Stacey Meredith of Meredith Design Co.